Autumn God, as our planet rotates and the earth signals a change, we sense a change in the seasons. We see shorter days and weather reports about frost, and crops are being harvested. Looking ahead to the changes brings mixed feelings. Help us to remain open during these “seasons” of change to your love and grace. And may we ask for and give thanks in all times for your guiding presence. Amen. What do workers gain from their toil? I have seen the burden God has laid on the human race. [God] has made everything beautiful in its time. [God] has also set eternity in the human heart; yet no one can fathom what God has done from beginning to end. The book of Ecclesiastes is one of the Books of Wisdom in the Bible. It literally means “teacher.” In these pages, the writer shares the many things that he has done to find happiness, wisdom, and pleasure. Instead of feeling hopeful, at times he felt more hopeless. October is a season of change. The leaves in Baltimore and many parts of the country are just starting to turn their beautiful shades of reds, oranges, yellow, and brown. Our summer is finally fading into autumn and soon that will fade into winter. The seasons always change. 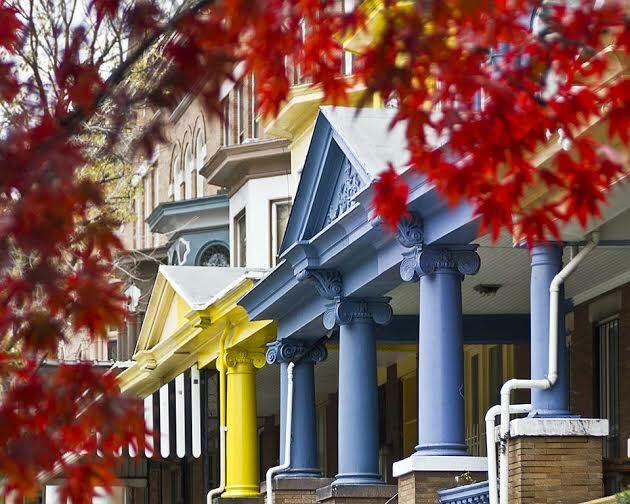 Most of the changes I love experiencing: crisp mornings, beautiful colors complimenting our brightly painted houses in Charles Village (my neighborhood), and delicious apples. And yet many of these seasonal changes remind us of literal darkness. For even as the leaves changes and the smells of apples and cinnamon waft, it gets darker earlier. There seemingly is always good mixed in with not-so-good. Like the changes in season, we also experience changes in our lives. Some fall in rhythmic pattern and others come or happen to us without warning. But the seasons don’t change how much God loves and cares for us. God’s love for us remains constant. Not matter what happens or when, God is always there to guide, carry, and laugh with us in the seasons of our lives. God is always there. What is your favorite season? Do you think our favorite seasons change as we grow up? Wonder question: How do you think God felt when God made creation? There are lots of awesome fall activities that can be or become spiritual practices. My daughters love picking up fallen leaves on their walk to and from school, so we are always looking for a way to display God’s handiwork. Besides leaf rubbings and ironing them between wax paper with crayon shavings, we’ve enjoyed making leaf people. It’s a craft quite popular on Pinterest. Autumn leaves— it works best if they are already dried/flattened. Sharpie markers–as most on Pinterest note, the metallic sharpies work best. 1) Have fun creating your leaf people, pets, and !! Create yourself, your pet, your principal, whatever you like. Let your God- given creativity go wild as you celebrate God’s beautiful creation with this craft. 2) Use your creative art to remind you to give thanks for this season and God’s never-ceasing, never changing love for us.